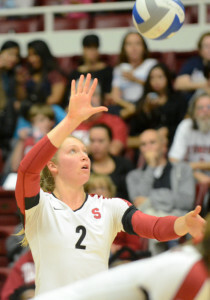 The Stanford women’s volleyball team (7-2) enters Pac-12 play today with some definitive wins under its belt, during which it has capitalized on leads and never let up. However, the journey has not been completely smooth, as the Cardinal has also been dealt its share of tough road losses. After losing to top-10 Florida and Texas, the Cardinal fell from the No. 4 spot to No. 8 in the NCAA rankings. The team, however, recovered with strong wins over Cal Poly and Saint Mary’s last week. In doing so, it jumped up one spot to No. 7 and is looking forward to opening the season against rival Cal. With all of his starters returning, head coach John Dunning rightfully expected there to be strong leadership on the court. So far, seniors Carly Wopat and Rachel Williams have not disappointed in providing momentum for the team when needed most; in Friday night’s contest, Wopat won the match point with an ace to seal the victory against Saint Mary’s. Even so, this team is no one-trick pony. All of the starters have contributed immensely to the team’s seven wins, and Dunning will look to all of them to take down the Golden Bears (7-2) tonight and the Arizona State Sun Devils (11-1) on Friday. Williams currently leads the team with 3.17 kills per set, with Wopat and Howard right on her heels with 3.14 and 3.13, respectively. Cal senior Adrienne Gehan, however, ranks third in the conference and 20th nationally with an impressive 4.3 kills per set to go along with a .327 hitting percentage. Also leading the Bears is sophomore Lara Vukasovic hitting .441, with the Card’s most accurate hitter being Wopat at .513—third in the nation. Doing great things for Stanford on the defensive end is junior libero Kyle Gilbert, who leads the team with 4.39 digs per set. Sophomore Inky Ajanaku and Wopat are the team’s blocking beasts with 38 blocks each on the season. And the Card would be nowhere offensively without sophomore Madi Bugg, who has recorded 341 of the team’s 407 sets. Stanford is picked to finish atop the Pac-12 again for the seventh time in its last eight seasons, while Cal is expected to finish seventh. Stanford leads the overall series in the “Big Spike” with Cal 64-12. Friday’s contest against the Sun Devils should be a more competitive matchup, as No. 16 Arizona State managed to easily break into the top 25 by dominating from the start in a victory. The Sun Devils are led by sophomore Whitney Follette and her .346 attack percentage and sophomore Macey Gardner with her 4.94 kills per set. “There are a lot of good teams with ups and downs and it shows we just need to come and bring our best everyday, and that’s the way we’re gonna be successful,” said Howard. The Cardinal travels across the bay tonight to take on Berkeley in the “Big Spike” at 7:30 p.m. and then plays Arizona State at home on Friday at 6 p.m. Contact Ashley Westhem at awesthem ‘at’ stanford.edu. Ashley Westhem was Editor in Chief of Vol. 248 after serving as Executive Editor and Managing Editor of Sports. She is the voice of Stanford women’s basketball for KZSU as well as The Daily’s beat writer for the team and aids in KZSU’s coverage of football. She graduated in 2016 and is currently a Communications masters student. Ashley is from Lake Tahoe, California.